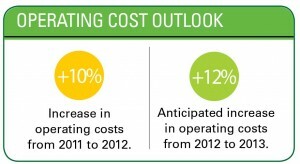 Landscape companies seek savings as they plan for cost increases in many areas of their businesses. 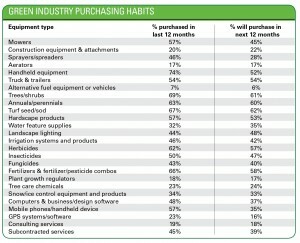 Controlling costs is a major focus of most successful businesses, and the Green Industry has been no exception to that in 2013. Todd Pugh, CEO of Todd’s Enviroscapes, a $11.5 million company in Louisville, Ohio, estimates his costs are twice a much as they were 10 years ago, despite having to charge 10 percent to 15 percent less than he once did. 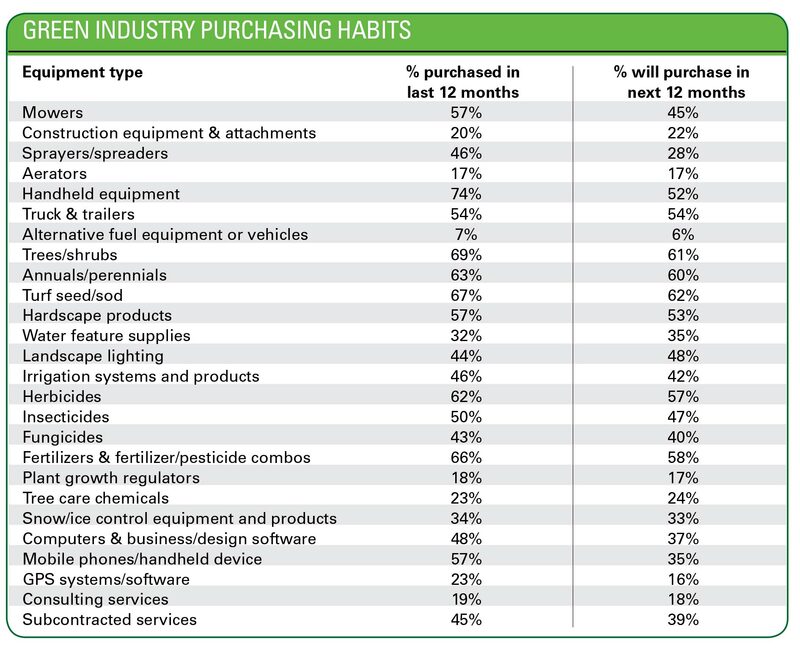 The Landscape Management 2013 Industry Pulse report research reveals how that shift could happen over a decade. 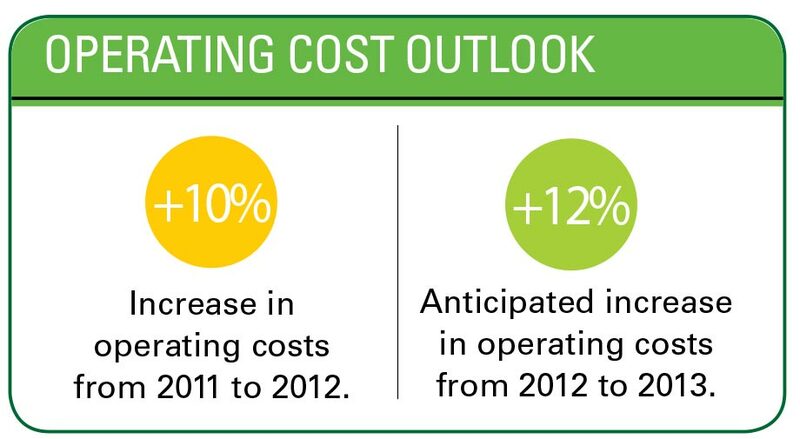 The average landscape company’s operating costs rose 10 percent from 2011 to 2012 and are expected to be up 12 percent from 2012 to 2013. 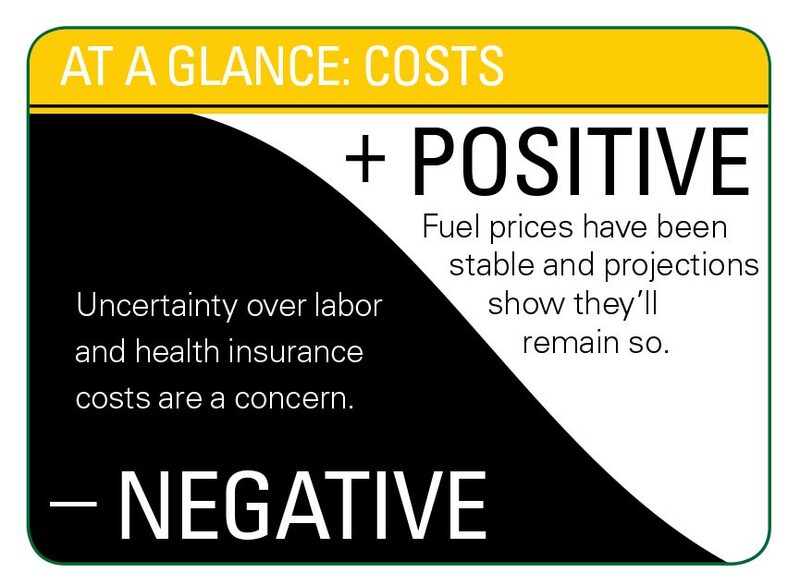 While fuel, a perennial concern, has stabilized over the last two years, sights are set on other potentially costly uncertainties, namely health insurance and labor (for more on labor, see “Labor Report: Force to reckon with”). 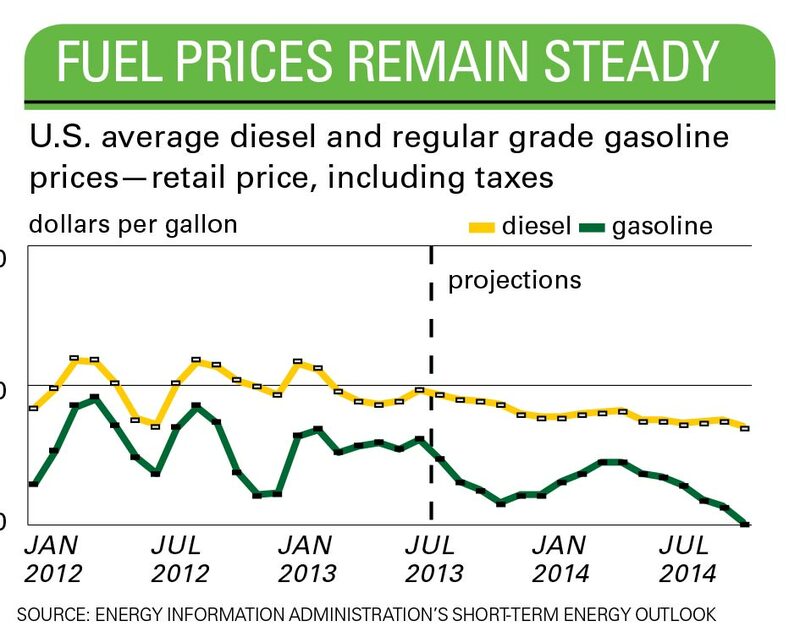 Although many contractors say fuel costs were less of a concern this year than in the past, the LM Industry Pulse report shows average landscape companies’ fuel costs were up 14 percent in 2012 and are expected to be up 11 percent this year. 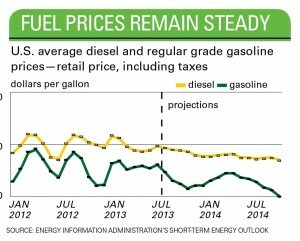 As for next year, the annual average price of retail gasoline is expected to decline from an average of $3.63 per gallon in 2012 to $3.52 per gallon in 2013 and $3.37 per gallon in 2014, according to the U.S. Energy Information Administration’s Short-Term Energy Outlook in August (see “Fuel Prices Remain Steady” chart). That’s welcome news to contractors like Pugh. 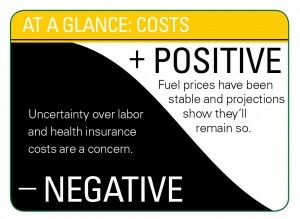 Even though he has seen fuel recently as low as $3.30 per gallon—“the cheapest in a long time”—his company makes it a point to cut fuel costs. Its crews are working four-day workweeks as much as possible, it has implemented GPS technology to help with routing and it’s enforcing a no-idling policy. At Images of Green in Stuart, Fla., President and CEO Jeff Bowen has seen stable gas prices between $3.60 and $3.80 per gallon. He keeps costs down with on-site fuel tanks so the crews on his 16 vehicles don’t have to waste time and money stopping at gas stations. He is also part of a fuel co-op. The $1.8 million full-service firm spent about $75,000 on fuel last year and will spend a little more than that this year, Bowen says. Steve Chepurny, president of Beechwood Landscape Architecture & Construction in Southhampton, N.J., is also pleased with the relatively steady fuel prices, compared to other years. The $6 million full-service firm has gone as far as to “protect itself” on fixed contracts by implementing fuel surcharges. 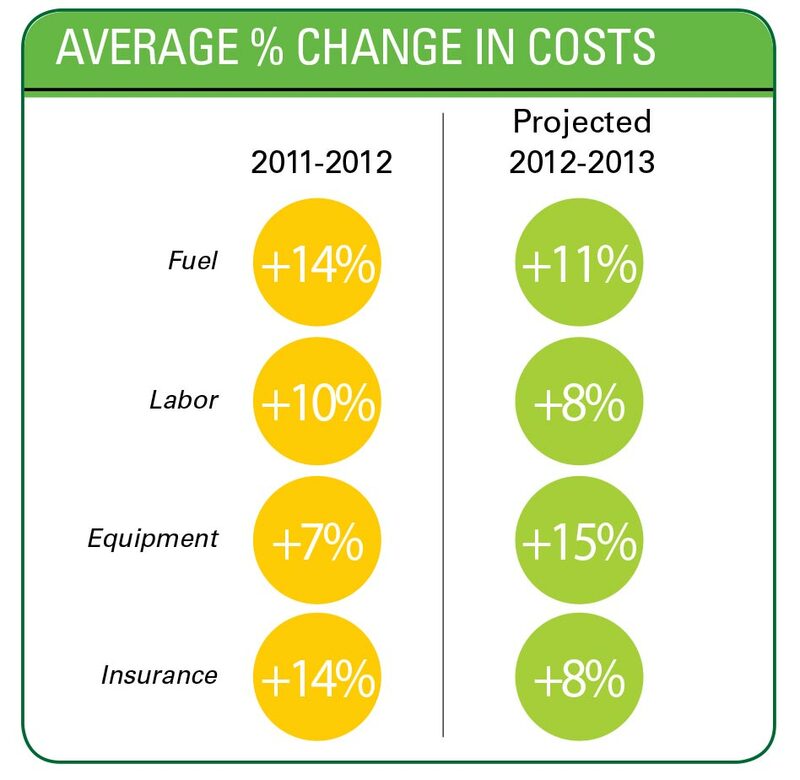 The LM Industry Pulse survey shows contractors’ equipment costs rose 7 percent in 2012 over 2011 and they expect them to go up another 15 percent for 2013. “I think it goes up 5 percent every year,” says Chepurny of equipment prices. He purchased one truck this year and may have to get another one by yearend due to the company’s growth. Dan Dahlkemper, owner of Dahlkemper Landscape Architects & Contractors in Erie, Pa., says “everything seems to be up a little.” His company has an annual revenue of around $3.5 million; it’s about three-quarters design/build and a quarter maintenance. The cost that’s most troubling to him is when vendors—typically hardscape and plant material suppliers—tack on fuel surcharges. “That just bugs me,” he says. Bill Banford, president of The Sharper Cut in Upper Marlboro, Md., also has seen increased fuel surcharges on bulk product deliveries. The biggest upswing in pricing he’s witnessed has been for materials like lumber and vinyl products. Because these prices have increased by about 30 to 40 percent, The Sharper Cut has increased its deck-building prices. Insurance costs are another obstacle for landscape companies. 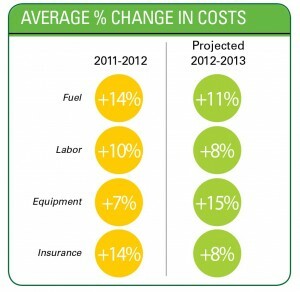 LM Industry Pulse research shows landscape firms’ insurance costs increased 14 percent from 2011 to 2012, but companies are anticipating only an 8 percent increase for 2013. Workers’ compensation and liability coverage are always on their radars. Ask Chris Casselberry, owner of GreenSeasons, a $7 million, full-service landscape firm based in Baton Rouge, La. Despite just a slight increase in workers’ comp and stable liability rates, his insurance agent cautioned him both will go up next year. As for health insurance, the Affordable Care Act (ACA) has small and medium-sized business owners scratching their heads. In July, the Obama administration delayed the “employer mandate” provision, which requires employers with 50 or more full-time equivalent employees to provide health insurance for their workers or pay a $2,000 penalty per employee. Implementation of this provision has been put off from 2014 until 2015, which buys employers time in the short term, but doesn’t take away any uncertainty. Andrew Ziehler, owner of Ziehler Lawn & Tree Care in Centerville, Ohio, has 16 employees and is struggling with anticipated health insurance costs. “What we’re facing here in 2014 is going to be an outrageous amount of increase in costs,” he says. His company may see 60 percent to 80 percent increases for its group health care plan premiums. For that reason, he’s toying with the idea of dropping the plan so his employees can go to the state health insurance exchanges, mandated by the ACA, and buy insurance there more affordably. Enrollment for these exchanges begins Oct. 1. “It will raise big questions as to what we provide as health care benefits through our business in the next few years,” Ziehler says of the ACA. On the other hand, Dahlkemper has seen his health insurance premiums go down some, which he credits to the ACA. Even so, he’s looking forward to his state exchange. He expects it will allow some of his employees to get better rates, which could lessen the burden on the business.